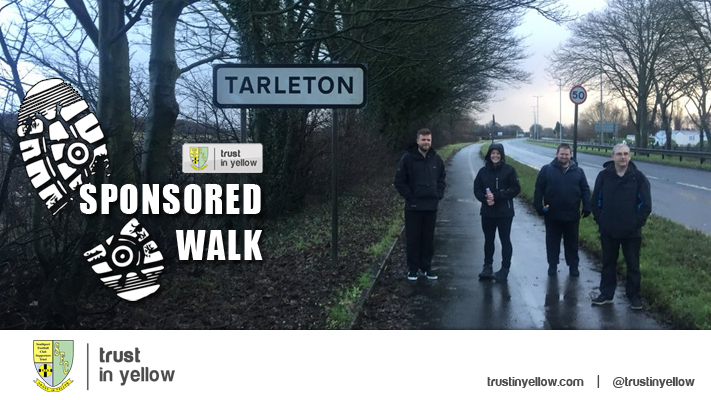 TRUST IN YELLOW WEEKEND TRIP 2016 - WHERE WOULD YOU LIKE TO GO? Saturday, 9th April - Boreham Wood: North London so possible time in London. Saturday, 23rd April - Aldershot: To see one of our honorary members playing for the opposition! One of those destinations stands out but the problem is whether ourselves or Torquay might reach the FA Trophy semifinal. If we were playing a semifinal at say Gateshead on that day the attractions of Torquay wouldn't be so great! And we might have large cancellations fees to face. Could we leave a booking until the New Year? We would very much appreciate the thoughts of members especially those who are thinking of going on the trip Email your views to Martin Robinson at dmjrobinson@btinternet.com OR come into the Trust office to discuss it OR tell any Trust board member (for instance on one of our coach trips ) OR come along to the AGM. We would like to make a decision in early October if possible. 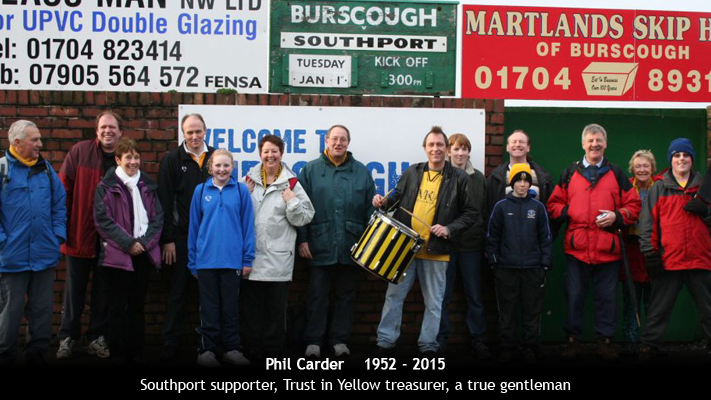 In January, Trust in Yellow lost a great friend in Phil Carder, a lifelong Southport fan and our long-serving treasurer, who sadly passed away having suffered from leukaemia. Phil was a true gentleman, he carried out a huge amount of work for the Trust, and he is greatly missed by everyone involved in the Trust and at the club. This Sunday, Phil’s nephew, Jacob, is running the Great North Run in memory of Phil, with all funds raised going to Leukaemia & Lymphoma Research. It will be Jacob's first long-distance race and he says it is a fitting opportunity to raise awareness and money to help others affected by leukaemia. BOOK NOW FOR FOREST GREEN! We still need a few more bookings to ensure this coach runs so please book your place now by calling or texting 07861 416859. The fare is just £19 for members, £14 for juniors and £24 for non members which is a significant reduction in last season's prices. 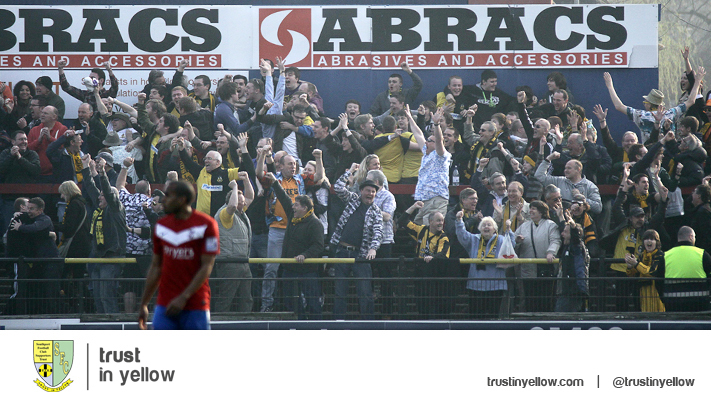 The coach will depart the Merseyrail Community Stadium at 9.30am. 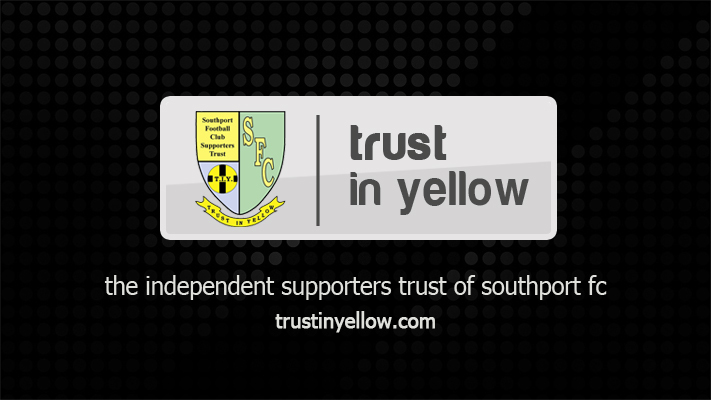 Trust in Yellow would like to thank everyone who attended the quiz night after Saturday’s match against Dover Athletic and helped make it a success. 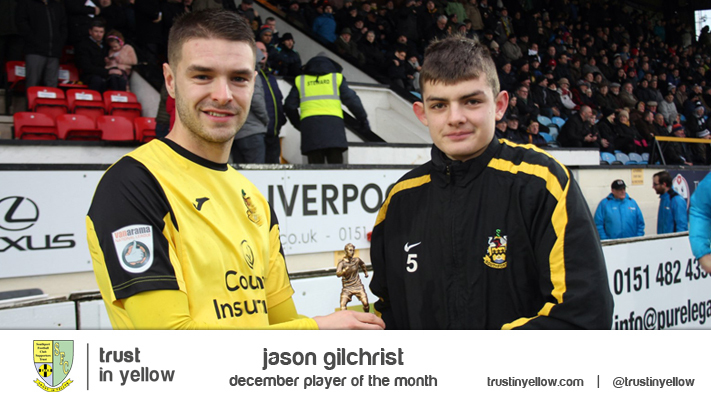 The Trust was very pleased with the turnout at what was a fun event with rounds on general knowledge, TV and film, music, sport and Southport FC. Congratulations to the winning team, consisting of Nicola Hudson, James Cave, Les Rooney and Andy Rea. Prizes were also given to the teams finishing in second and third place, which were collected by Pam Orme and Mick Hopkins respectively. The quiz was the latest event in the Trust’s new Get Involved! programme, which continues with a Race Night and Meet the Players after the match against Torquay United on October 10 in the Grandstand Bar. Winning team, Nicola Hudson, Andy Rea, James Cave and Les Rooney with Trust in Yellow's Martin Robinson and Noel Warham. Runners-up team represented by Pam Orme. Mick Hopkins collects the prize for the third-place team.